Winter is here, which means cold, snowy weather is creeping in. Your dog may not be able to enjoy the dog beach or a sunny day at the park, but that doesn’t mean he can’t have fun. Limit your dog’s time outdoors in the cold weather. Consider dressing your pup in booties and/or a sweater to help keep him warm. Always provide plenty of fresh water so your dog does not seek hydration from eating snow that may contain chemicals, dirt, salt, etc. After play, clean your dog’s paws and remove any de-icer residue which is toxic to dogs. Remember that older dogs or dogs with arthritis may not be as tolerant to cold weather. If you have any concerns with winter safety for your pet, contact your primary veterinarian. With safety as a top priority, consider these five activities to keep your dog happy and active during the chilly months of winter. Fetch is a fun game that provides both mental and physical stimulation for your dog. If played in moderation, it is safe to play fetch outdoors in snowy weather. Use a bright-colored disc or ball that is easy to find in the snow. Avoid playing fetch around ice so your dog does not slip and fall. If you don’t have a throwing toy handy, your dog may even enjoy running after snowballs. This clever idea gained popularity after dog owners started sharing videos of their snow mazes, such as this one, on social media. To make a snow maze for your dog, simply create narrow pathways in your yard with a snow shovel. Then connect the pathways in fun, twisty patterns like a maze. Once you create your maze, release your dog and watch him navigate through the pathways. Not only will your dog get plenty of exercise running through the maze, but he will also get mental stimulation from trying to find his way out. Be sure to make your snow maze in a fenced-in area where your dog cannot get away. Otherwise, keep your dog on a long leash. Click here for another snow maze video. If it is too cold or dangerous to play outside, research indoor dog parks or doggie day cares in your area. 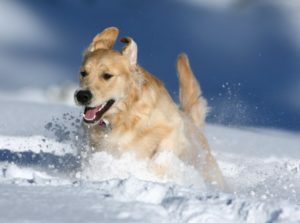 These facilities allow your dog to exercise and socialize while avoiding all of the potential dangers of winter weather. These options will cost you something, but you could think of them as special treats you give to your pup a few times each winter. The phrase “Do you want to go for a walk?” will excite your dog no matter how warm or cold it is outdoors. You can still safely walk your dog in the snow. Consider taking your dog for shorter walks more frequently throughout the day to avoid long-term exposure to the cold. Watch your dog carefully throughout the walk for signs that he is cold; if you notice him shiver or shake, end the walk and bring him indoors. During the winter you will likely spend a lot of time indoors, so take some time to train your dog. Teaching your dog a new trick or command keeps his mind active while also strengthening your connection with him. All you need is patience and some small treats for an indoor training session with your dog. You can teach useful commands, indoor mannersor even basic agility training. Your dog might not get time outdoors, but he will still be active and entertained. Cat Sneezing: Does Your Cat Have a Cold?